PAUL BISHOP ~ WRITER: TAKE A CHANCE E-BOOKS ~ CLAN! TAKE A CHANCE E-BOOKS ~ CLAN! AN ONGOING SERIES HIGHLIGHTING POSSIBLY DIAMOND IN THE ROUGH E-BOOKS BY RELATIVELY UNKNOWN AUTHORS, FOUND WHILE CRUISING THE E-BOOK SHELVES ON AMAZON WITH PRICES MAKING THEM WORTH TAKING A CHANCE ON . .
TODAY’S FIND . . . HORROR! 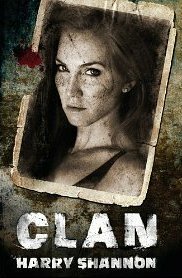 "CLAN is a thriller with a genuine bite. Once Harry Shannon gets his claws in you he will not let go! Highly recommended." “A scary-as-hell journey through nightmare country." "(Shannon’s) Impeccable pacing and eye for the terrifying will leave the reader shaken and unsettled." "Harry Shannon is a writer who is not afraid to walk into the shadows and drag the things living there kicking and screaming into the light." Thanks for the mention, Bish.